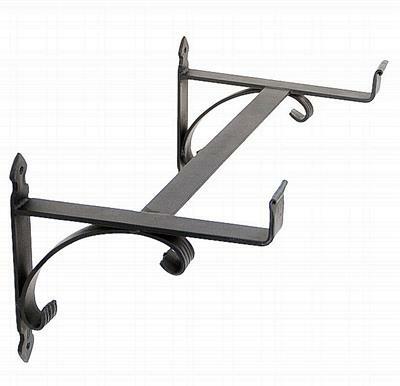 A sturdy and durable accent, this scrolls flower box bracket is just the ideal piece that you need for holding even the heaviest of your window boxes. It comes with two scrolled brackets joined by a crosspiece. a closer review will highlight a decorative element beneath the flowerbox. Designed to hold heavy windowboxes while offering the lowest profile for window clearance. Wrought Iron. Black Powdercoat finish. Dimensions: 10"H x 24" x 10.5"